Travis Pastrana has had no desire to get back on a motorcycle in the last couple of months as he tries to rehab his shattered right ankle. The action sports star competed in the Race of Champions in December, tested a car for the Rolex 24 At Daytona a couple of weeks ago and is scheduled to test a Nationwide Series car next week. Pastrana had been scheduled to make his much-anticipated Nationwide debut last July but was sidelined for several months after suffering an injury to his right ankle and foot during an X Games competition two days before the Nationwide race at Lucas Oil Raceway in Indianapolis. So Pastrana, who was going to run seven Nationwide races in 2011 with plans for 20 in 2012, now will do seven Nationwide races in 2012 with sponsorship from Samsung and Boost Mobile plus a full NASCAR K&N East Series season. 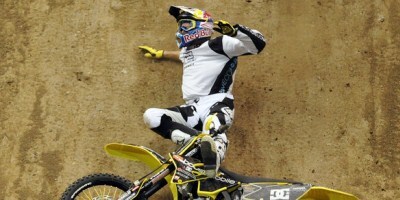 “I feel really good,” Pastrana said Saturday during NASCAR Preview 2012. “The walking has been a lot better. The therapy the last two weeks has made huge improvements. It has taken so long to where I could put weight on it, and now I’m doing a lot of cycling, doing a lot of swimming and doing a lot of physical therapy. The 28-year-old Pastrana plans to make his Nationwide debut in April at Richmond, a place where he has run in the East Series and also close to his home state of Maryland. Mike Greci will serve as his crew chief for both cars, which will come out of Michael Waltrip Racing. Because Pastrana is a Red Bull athlete and MWR has sponsor ties to 5-Hour Energy (as primary sponsor for Cup driver Clint Bowyer), it expected that the Nationwide team, known as Pastrana Waltrip racing, will undergo a name change. While saying he can’t comment on the name change, Pastrana obviously will still be associated with the Waltrip team. He is co-driving in the 24-hour race next week in a Ferrari that also has team co-owners Waltrip and Rob Kauffman on the driver lineup. The test went well in the endurance car. Now Pastrana needs to show he can compete in stock cars – for himself and sponsors.